“Last year, a group at the University of York was given some samples obtained from several folios of the MS by the Beinecke library. These were used to determine the species of the animal based on protein identification. This requires only very minute samples. Apart from some 10 or so folios, also the cover was sampled. The vast majority of MS parchment is from cow (calf), sheep or goat. The idea was, that if the animal turned out to be goat, it would be a very strong indication of an Italian origin. The cover gave a negative result. The experts said that this is not unusual due to the frequent handling. All folios were positively identified as cow. The cover was later identified by a professional parchment maker as goat. The innocuous insect holes on the first and last folios have never attracted much interest, but they have a story to tell. A few years ago, Ellie Velinksa already noted that they looked very similar to the insect holes on the Boccaccio MS now preserved as MS 100 in the library of the University of Chicago, which equally appear near the edges of the first and last folios. The relevance of the Boccaccio MS in this context is that it is one of the 20-30 MSs that Wilfrid Voynich acquired from the Jesuits at the same time as the Voynich MS, around 1912. She wondered if the two MSs had been stored close together for a longer time. (This refers to the Boccaccio MS mentioned above). In the catalogue of Vat.Lat. 11414-11709, written in 1959 by Mgr.J. Ruysschaert, we may read that many of these MSs have been rebound by the Jesuits of the Collegium Romanum, though he did not indicate that it was almost the complete collection. Thus, we know that the present cover of the Voynich MS was added (presumably replacing an earlier one) by the Roman Jesuits, i.e. after the MS was received by Kircher. But what about the insect holes? These received some attention from several conservators who had opportunity to study the MS for several hours in November 2014, on the occasion of the exhibition in the Folger Library in Washington. [See discussion and photos here.] The first thing that was pointed out in relation to this is that these insects are not interested in parchment at all, but in wood. Seems obvious. It explains why they did not ‘eat’ themselves deeply into the MS, but only nibbled at the first and last pages. This led to the observation that the original binding of the MS almost certainly had wooden boards, covered by something. There is more that can be said about this cover, which is likely to be published sometime in the future . The location of the wormholes matches well with the places where the insects could move in and out of this cover. we learn that the MS collection was described, sometime in the 18th Century, as “old books infested by worms”. The MS were subsequently sent to a binder, where they were rebound, usually without having to replace the old stitching. The Boccaccio MS seems to have undergone a similar fate. Thanks to Rene. Any comments or ideas welcome. Hello Nikolai, and thank you. Unfortunately, many many people before you have claimed they can translate odd words here and there as being in various languages, claiming they are Greek, or Russian, or something else. However, it is hard to take such claims seriously because unless you can show an underlying grammatical system, or wake show direct links with key illustrations in the manuscript, it looks as if such attempts are self-delusions. See my article here which discusses the grammatical aspects in detail. So if you can tell us more about the grammatical system (and not only selected words) or show a direct link with key illustrations, please do add more details. I, along with (I suspect) countless others, would love to see the report on this… the results from which the opinions have been derived. I hope they become available. I would be interested to know what constituted a “negative result”. This is one of the reasons I would be interested in seeing the date, pre-opinion. As I have learned, and has been famously admitted on occasion, interpretations such as this are based on assumptions. So was it that there was not enough material to determine the source of the cover skin? Or did it point to something other than cow, and was so deemed in error? Did it sway towards goat, in fact? Without seeing the raw results, and the reasoning behind declaring them “negative”, I ask. 3) “The cover was later identified by a professional parchment maker as goat. But then, if the cover was goat, and if goat was a pointer to Northern Italy for the pages, then wouldn’t finding goat was used for the cover then preclude the Jesuits having covered it? 4) “Ellie Velinksa already noted that they looked very similar to the insect holes on the Boccaccio MS now preserved as MS 100 in the library of the University of Chicago, which equally appear near the edges of the first and last folios. The relevance of the Boccaccio MS in this context is that it is one of the 20-30 MSs that Wilfrid Voynich acquired from the Jesuits at the same time as the Voynich MS…”. Another possible interpretation of this is that the source of the calfskin for both folios was the same. In fact, if a cover was on both books, would this not interfere with a good alignment of wormholes? So if such an alignment was seen, it would imply the PAGES, or their material, was close to each other, less so the finished books. 5) “What these two, and several other of these 20-30 MSs also have in common is a very similar cover. When I was corresponding, about two years ago, with one of the MS experts of the Vatican Library, I learned that the vast majority of all MSs among Vat.Lat.11414 – 11709, which came from the same collection sold by the Jesuits in 1912, have identical covers, and she confirmed that the one of the Voynich MS is quite similar. We do not, as far as I can tell, from what is reported here, that we “know” any such thing. In fact, as I’ve pointed out above, I believe this finding of goat as the cover material may work against this opinion. The thing about Voynich, on death, leaving behind this pile of loose stickers… which I have seen in person, also… is that they are for the most part accompanied by a second set of stickers: That is, the ones with the written descriptions of the books they came from. So the fact that Voynich removed, and kept, these stickers, is no evidence the Voynich came from this same source, or was ever in the Becx library. Genuine or not, he had the stickers, and simply had to stick one in there to add this provenance. In fact, I would rather ask where the Voynich manuscript’s written description went off to, if it ever existed? This goes to my point #4, above: If these worms imply wooden boards, then common sense dictates it was not two books… the Boccaccio and Voynich… side by side, but rather that the pages were, with or without a board next to them. Do they normally burrow through two layers of board, and two to four of covering, and remain lined up enough to show what is seen here? And now, with the new revelations, it has stalled? Rather, I would say that it has not gone in a direction the old paradigm has allowed for so long. The “old list” was great, but stifled by a general acceptance of many old saws that have either proven to be incorrect, or are justifiably questionable. In defense of the “new list”… and I would contend that under my watch as admin, it is actually “the same list”, progress has been made… much progress. However is is how one views these new ideas and insights that might color whether one considers that progress or not. And this sort of discussion is a perfect example… Mr. Bax has rightly allowed posting of very interesting information, and rebuttals and comments on it… information which would be allowed on the List, but not on other private blogs. Only by isolating the List… and general public.. from this information, these opinions, and the (so far hidden) reports they are based on, will we continue to stagnate. Well forgive me if I assume I am Mr. Fora here… but I never suggested that the Beinecke is purposely withholding anything. I do think that they trust the judgement of others to decide what should, and should not be released, by proxy. Am I wrong in this? And forgive me (again) but the ink report was quickly released. There is no reason the C14 should not be… the producers don’t mind, and this has been made clear to the Beinecke. So I don’t think it is as simple as a natural, expected delay, and not that the Beinecke is holding it back… but that they may be advised to do so. Again, correct me if I am wrong. 11) “The 20-odd books that Voynich acquired, and the 300+ that are now in the Vatican, definitely come from the same collection…”. Answered in my #6, above… we in know way “know” this, nor is it “definite”, given the little that we do know. In fact, I can, have and will continue to argue that the known evidence at least leaves open that these 20-30 books are from somewhere else, and at most, that they probably are from some other place(s). There is so much more… but the above I think illustrate my position, which, I would argue, is somewhat reflected in the other responses here: It is one thing to claim absolutes are known, when everything it out in the open, and those absolutes can then be challenged. But it becomes difficult and frustrating when the absolutes are based on information we cannot see. Worse yet, they are conclusions based on a cherry picked assortment of amateur and expert opinion, when other expert and amateur opinion is roundly rejected. If these conclusions, so stated, are as firm as claimed, then why not put it all on the table? Openness and transparency, as Nick wrote, is all everyone is asking. Then people can form their own opinions, and as I have observed, both in this case, and historical in this and others, we have a real chance at progress. If the paradigm can handle it, it deserves to exist. If not, then noone should be defending it, in any case. a goatskin cover doesn’t indicate northern Italy. Or as least the implied “only” is totally misleading. Goatskin was a typical material for books – internal and external uses – in North Africa, Spain, and Constantinople to mention the first three areas that come to mind. It’s this constant notion that if something (say the picture of a crossbowman) occurs in one place, then it *only* occurs there – and from that completely unjustified inferences that the manuscript must have been entirely conceived and produced there… this is what I call ‘house of cards’ thinking. It’s ok so long as you prevent anyone so much as breathing on it. I’ve recently put up an image of a crossbowman (‘birdshooter’ type) from a Spanish Jewish manuscript, but from the general level of discussion, you’d think any image of a crossbowman was equivalent to a stamp saying ‘made by German speakers’. Pictures of crossbowman occur all over the place. They have no nationality. What locates the image is an explanation of the figure’s anomalies like its flouncy-looking knee-length skirt or ‘twiddling’ hand. – The protein testing was a scientific result, not anyone’s opinion. Certainly not mine. – Goat does not point to Northern Italy but to Italy in general (for the middle ages). – Insect holes (‘woodworm’) are not found in blank parchment sheets before the book making process (your point 4). They appear much later. – I did not have you in mind when I wrote about accusations of hiding stuff (which are plentiful), but I would say that it would have been justified by a comment like: “Or did it point to something other than cow, and was so deemed in error?”. – The university of York do not require their results to be approved by participants from internet fora. Not me, not you. Yale of course accepted them as they are. – Your point 11: this is absolutely certain, from a whole range of independent sets of evidence: original sources, internal consistency, Roman College shelf marks etc. etc. I realise from your comments, that you are not aware of most of the evidence. The Beckx stickers are not as important as the sheets of bibliographical notes (your comment nr. 7 is not very accurate and therefore confusing), and the consistency of these notes with the 1903 catalogue. Turns out, there was no such thing as a Beckx library. These Beckx stickers were a device from the Roman Jesuits for additional safety against confiscation. The bibliographical notes are much older, and the Beckx stickers were added much later. Whoever doesn’t want to believe it, may decide to ignore it. Nobody has ever been really interested in the life of the MS between 1665 (when it was sent to Kircher) and 1911-1912 when Voynich bought it, but it turns out to be a fascinating part of its history. Of course, it won’t tell us anything about what the text of the MS says, and that’s what most people are interested in. However, there is more to the MS than what the text says. I will leave it at exactly this. I take your point that this page is a ‘work in progress’ but to me it seems already an impressive and thoroughly well researched contribution, so thanks again. I am aware, and have no argument with the sources of the general collection of over 200 books. My objection is to the use of the assumption that the 20-30 books Voynich purchased are certainly from that collection. The two are separate issues, that is, and should remain separate in any discussion of this matter. In that case, it is very relevant that additional, hand-written descriptive labels accompanied some Beckx labels, but not others. The Voynich is one of these. The Voynich also does not show in this 1903 list… some of the other 20-30 do (to my understanding), some do not. These are important clues to the real provenance of these books, and I do not feel I am in error in differentiating the type and level of evidence in the individual cases, and on the contrary will not lump them all into one larger set, and so I do not consider the case closed. It is far from “absolutely certain” to me, that is, and I do not think I am alone. Whatever the Voynich is, or turns out to be (if we ever know), this part of the provenance is very poor, inconsistent, and questionable… and in my opinion, and in the opinion of others, deserves much more scrutiny before it is considered settled. “… what it should deserve: to be treated like a genuine old MS with a purpose and a history”. I should perhaps add that I based my own codicological conclusions in “The Curse of the Voynich” not only on close examination of digital scans, but also on examining the manuscript itself for three days at the Beinecke. My position these days is that I see no evidence that the Voynich Manuscript *in its original state as left by its author* was anything apart from a set of unbound gatherings. John Grove’s inference that the exposed fold (with its knife incisions, as we now learn) in Q9 was the author’s original gutter was based on the position of the Q9 quire mark, and I argued that this is supported by the way that refolding that super-wide folio reveals symmetry in the content. This further strongly implies that the original binder himself/herself made preliminary knife incisions along that fold following the instructions given by the quire numbers, but then unilaterally decided to stitch it along a different (and more centrally placed) fold. Rene: I have to say that I don’t really think the way your comments here seek to divide the world into professional and amateur really do either presumed “side” justice. 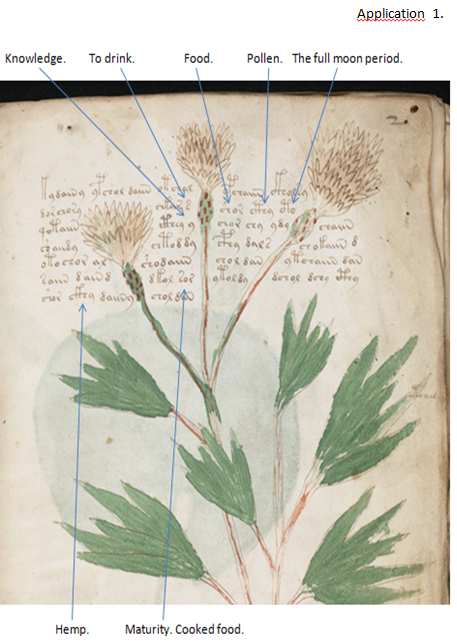 The key problem with the Voynich Manuscript is that it necessarily involves reliably reasoning across and between the evidence from many specialities, a skill which is in short supply everywhere. In my opinion, the only sensible path to move forward with this is one based on openness and transparency, so that individual specialists can contribute to the wider reasoning that needs to take place: and so I continue look forward to anything – literally anything – being made public from the discussions from November 2014, along with the multispectral images, spectroscopic analyses, UV scans, etc that have been captured but which remain resolutely unpublished. In relation to Nick’s last point, I have recently been contacted by the Director of the Lazarus project (http://www.lazarusprojectimaging.com) who were allowed by the Beinecke last year to make multispectral scans of a few folios of the Voynich manuscript. He contacted me in case we could use them to detect any extra linguistics features not seen before. I now have eight of these scans, including some of f116r (the last page) and am trying to process them to post on this site. However, they are so huge that I am having problems uploading them. Still, I will keep working on them to get them out as soon as I can. Stephen: thanks for replying – what image format are the multispectral scans you have? I suppose I should dampen expectations by saying that I can’t see them adding much to what we already know about f116v, which has already been well explored. I can’t see anything new from the scan of that page. In fact the ones I were given are Jpegs, and the biggest is around 10Mb. They do give a lot of detail.I have four of f71r, 1 of f93r and 3 of f116v. One problem is, that these aren’t the actual multispectral images, which could be interpreted as a whole array of pictures in parallel, but something distilled from it. I don’t even know what format would be used for multispectral images, but it certainly isn’t JPEG. Typically, one could combine particular frequency bands of the M-S image in order to highlight the presence of one chemical element, such as iron. One application of the M-S images is to detect hidden writing. The only conclusion I heard so far from this particular exercise is that no such hidden (or erased) writing was found in any of the images, i.e. the MS is even more certainly not a palimpsest. I think I put it somewhere on my web site. I am as eager as everyone else to learn about more specific results. To do this, the idea is to take a load of images captured at different wavelengths and register them into a single ‘deep’ image, i.e. where each pixel isn’t so much (R,G,B) as (W1,W2,W3,W4,W5,…etc). Once you have that in place, you then select an area of the image you’re particularly interested in (the whole picture is normally way too big) and then devise statistical manipulations that make a particular aspect more visible, i.e. making carbon-rich ink look green and iron-gall-rich ink look red. However, you normally need high bit-depth input images to make this work, because the stats tend to be quite subtle, and you don’t know what you’re looking for at the start. The JPEGs that had been left on the Beinecke website seemed to me not to have been processed or manipulated in a revealing way. In that case they might not be very revealing – to give a taster of what they are like I have managed to reduce one in size and posted it here. One would have to know how they combined that image out of the raw data, and how they assigned the R, G and B components of the JPEG. Without it, one cannot make sense of it. One can just guess here that the particular combination highlights the paint used in some of the tubs. I am convinced that there is a veritable mine of information here, that, at present, we cannot do anything with. I don’t know how many images were taken, but I do know that f1r is one of them (obviously….). I don’t have any extract of it. amateurs have an enormous role to play here. I didn’t mean to belittle that at all. Particularly, if anyone is ever going to come up with a key insight in how the text was generated, I don’t expect it from anywhere else than a dedicated “amateur”. I have always said that this could happen literally any day. Klaus Schmeh captured that on video in 2012. Even though that’s 3 years ago now, I still believe that. Discussions in the old mailing list, from the early ninety’s for roughly a decade or so, have literally driven Voynich research forward. – what is the level of understanding of the proponent of each one. Of course, I enjoyed a couple of decades of getting deeper and deeper in all this myself, and I wouldn’t want to deny anyone the same interesting time. These fora are just fine. Mostly. Openness cannot be taken for granted, or at best with some delay. The notion, in some of the internet fora, that anyone (the Beinecke) would be hiding stuff, is of course not to be taken seriously. However, there are issues of ownership, copyrights and publication-related issues that can cause serious delays. The results of the C-14 dating are a case in point. The result was known in March 2009, and until May 2009 nobody even knew that it had even been done, until someone picked it up in some online Yale report. It was only published in December 2009. It gets worse when a planned publication never sees the llight of day. Rene: lots of stuff gets done but not released. I remember asking your friends the documentary makers back in 2009 or so if they would release the UV scans they took of various marginalia: I’m sure the Beinecke would be happy to host any such scans on their website. I’m (of course) not suggesting that the Beinecke is hiding anything: rather, as a matter of principle and/or contract, I think it should insist that scans or analyses be made public after a certain amount of time, regardless of publication. And I know (of course) you aren’t one of the ones making unreasonable accusations about the Beinecke…. Bravo, Nick. I appreciate greatly your comments here. You and I may be worlds apart in our opinions, but I wholeheartedly agree with you that “openness and transparency” are of great importance to potentially solving this riddle. Simply asking for such information to be released is not at all unreasonable request, and this seeming attitude that amateurs… and selected professionals for that matter… “can’t handle the truth” will only serve to hurt the investigation, and possibly end any possibility that the answer… if outside the current paradigm… might be found. Nick, I wouldn’t yet want to conclude that the unused incisions were made at the time of binding, i.e. after the folio was completely drawn and written (leaving aside the painting). This is because they are not coinciding with the heights of the sewing stations. An alternative explanation (of which one can equally express doubt), is that they were made beforehand, and then the author/scribe (presumably by mistake) started to write the folio while it was upside down. This was a suggestion by one of the conservators at the time. This meant that new holes had to be made at the time of binding. It would make sense (but I don’t know if it’s right), if the incisions were made to several folios at the same time, while they were folded together, so a mistake in the location of the incisions seems less likely…. It was kind of a ‘bad’ surprise, because the earlier explanation by John Grove and yourself was simple and sensible and made everything fit. Now, it requires more thinking, for example on why the quire number ended up where it did. I haven’t really thought about it myself. Whether or not there are older stitching holes to be discovered in the binding of the MS is still an open question. Again, there are differing views on this. The images show lots of holes, but these are clearly from our insect friends. The old paper remnants may be hiding them. I know that this will be looked at further. Absolutely true. Some of these issues have already been considered – I do not believe that it is necessary to see the object to discover such things as the distance between stations, or the type of stitch used (the Vms clearly has kettle-stitch visible in the scans, for example, and our documentary evidence shows that by the thirteenth century, vellum made (for example) in Germany was perfectly finished. We know that the Vms vellum is ‘rough’ – and that’s why the early specialists who had no vested interest or pet theory – all ascribed it to England or ‘somewhere southern’. Not Italy or Germany. Some of the other points Rene makes are just as valid. A number of them have already been researched in some depth, notably by Nick Pelling, who published on this subject in 2006, and has posts in his blog ‘ciphermysteries.com’ where he treats them too, as early as 2008.
that the present binding is not original. – can the stitching of the MS be dated and located? This is something I’ve been batting on about too, but lack of evidence prevents conclusions until we know more. – is there evidence of an earlier stitching? Yes – absolutely unmistakeable, even in scans. So much work has already been done – as much as can be – and while it is good to know that people outside the Voynich community are working on it, an interest in MS Beincke 408 does not necessarily equate to ‘amateur’ status, or level of ability. I recommend readers to Nick’s study of the subject, and that done – sometimes long ago – by earlier scholars, both amateur and otherwise. There’s so much wrong with this that I hardly know where to begin. Being part of the “Voynich community” (whatever that is) means absolutely nothing in terms of qualifications. When the “people outside the Voynich community” are qualified experts with a full academic training and many years of hands-on experience in manuscript conservation, then they are qualified. This is a gross simplification, and useless. It precisely requires trained experts seeing the actual MS to make useful statements about this. Completely untrue in all respects. The early ‘experts’ were not basing their opinions on the parchment, because they weren’t experts in that area. They were precisely following the vested interest of Voynich that it was a Bacon MS. Those who weren’t, actually suggested German (two who saw the MS), even Bohemian or Polish (one who saw only B/W photostats). I need to object to many of these statements, because most people here on this blog do not have access to the long history of internet discussions and published work about the MS, and certainly not to the discussions held among 3-4 conservators on 7 November last year, and might take all these statements at face value. Indeed, over the years people have expressed hypotheses about the page ordering, the origin of the foliation and quire marks, etc. but none of this is in any way conclusive. Hopefully, we’ll learn something more solid about this sometime in the near future. Sorry, I should follow up on my own post for one point. I wonder if the perceived evidence for an earlier stitching meant by Diane consists of the holes visible in the folds of f68, between the two outermost panels. 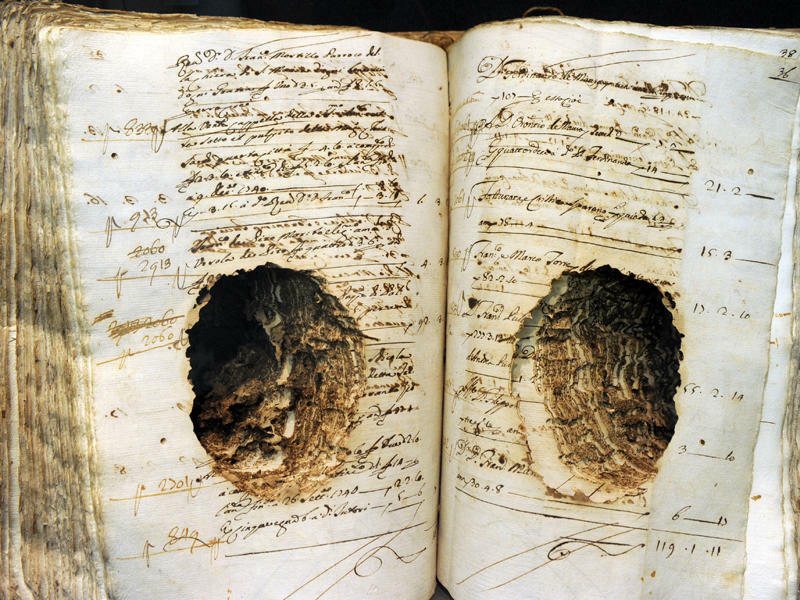 These holes have always been assumed evidence that the folio was originally bound into the MS along this fold. However, this was looked at in detail in November last year, and it turns out that these are clean short incisions by a knife, i.e. preparations for a later binding, but they were never actually used. They also do not line up with the present sewing stations (which could mean several different things). The significant wear of this fold is not consistent with the suggestion that this would have been part of the binding, but with the probability that this fold may have been ‘re-folded’ many times over the centuries, and was always exposed. Rene, I’m sorry but you do have a consistent habit of saying that “if x occurs in y, then it occurs nowhere else”. Experts in codicology (and palaeography, for the two work in concert) have written a great deal about the history of manuscripts and their production, not only within mainland Europe but across the Mediterranean. I have read a fair bit of that secondary literature over recent years, and I should doubt that my sources’ expertise would be doubted by any competent, or even very well qualified person. Because expertise occurs in the group having access to MS Beinecke 408, it does not mean that equal expertise cannot exist outside that group. My statement about the perfection of German-made vellum, by the thirteenth century, is an opinion drawn from those experts, even if not from those to whom you have spoken. Nick, Thanks for the clarification about those knife-nicks. Taken onboard. Of course I don’t doubt that excellent parchment could be produced in Germany as from the 14th Century. I also don’t doubt that there are excellent books explaining this. What I do strongly doubt (to put it mildly) is that all German MSs from the 14th Century onwards were written on faultless parchment. I equally doubt that any reliable source would state such a thing. It’s also not correct that I am biased towards a German origin of the MS. For me, we are still in the ‘data gathering’ stage, and it’s too early to draw any conclusions. I have no problem whatsoever that the language behind the text of the MS could be Hebrew, or some other non-European language. It’s worthy of investigation, precisely because it has not yet been done exhaustively. That doesn’t mean that the MS would not have been created in a roughly Alpine region. There’s a nice example of an alchemical herbal in Paris (all written in Latin or vulgate) in which the pages have been numbered in Hebrew, and another one in which the entire text has been translated to Hebrew. Both originate from Northern Italy. (to Nick: the former is the one Sergio Toresella mentioned to you, BN Lat 17844, which has a number of little dragon illustrations). Perhaps some of the codicologists you know will better explain this to you, but one of the ways in which a manuscript is provenanced is by reference to the level of finish, and the final touches given to, a membrane. Membrane produced in thirteenth century Germany – or what is now Germany – is distinguished from that produced, say, in England or Spain or Sicily at that time by the perfect equalization of the membrane: that is to say that the difference between the original hair side, and flesh side, is scarcely visible. On the other hand, even a century later, membrane produced in Spain has visible hair follicles and tends to retain hair (however fine) around the lower edges. One sees a similar effect on English-made parchment. That sort of thing was well understood even in the early twentieth century. You may recall one appraiser who noted it was rough, “even for the thirteenth century’ – i.e. the time Wilfrid posited for the membrane’s inscription. But my professional area is not codicology, and I daresay others among those involved in Voynich studies have looked into this matter more deeply, so I’ll stop there. Thanks for the constructive comment! Following up on a suggestion from Jim Reeds, when he saw the MS in the 1990’s, I asked the conservators (before the the event) whether they could identify the hair and flesh side of the folios. The purpose of this was to hopefully get some information on page re-ordering. If these were randomly mixed throughout, it would show that no attention was paid to this at all. If all folios were hair-to-hair and flesh-to-flesh, it would show that attention was paid to this, and there would be no evidence (at least from this point) of any page re-ordering. In the third case, one could have blocks with the ‘correct’ way, and some inconsistencies, pointing to changes. If these inconsistencies then coincided with sections in the MS, or areas where A & B folios are mixed, one could take it from there. However, after long scrutiny with and without a microscope, no distinction between the two sides could be seen by them, for the several folios that were checked. Only near blemishes, this was possible. The conclusion was, that, while the parchment was not top grade, at least it was prepared with the greatest care. No further conclusion was drawn from this…..
Of course, it is recently (as it was originally) described as vellum, rather than parchment. The hair-side to hair-side, flesh-to-flesh rule is known as “Gregory’s Rule”. It happens quite naturally with some folding methods. I’m quite surprised that the people you spoke to couldn’t tell the difference. In scans, and in Dana Scott’s detailed investigation, the presence of hair follicles is quite obvious, and Dana actually mentions that some folios had enough hair on them to feel like peach-fuzz. Interesting. If I might correct you on another minor point: you mention ‘cow’ skin, but it has been well known by observation for a long time, and recently confirmed by aDNA that parchment and vellum only came from calf-skin, not the skin of adult cow or bull. Timothy L. Stinson, ‘Knowledge of the Flesh: Using DNA Analysis to Unlock Bibliographical Secrets of Medieval Parchment’, The Papers of the Bibliographical Society of America, Vol. 103, No. 4 (DECEMBER 2009), pp. 435-453 (p.447). I must say I envy you Rene, not having to do nearly so much work as we do, who have not your access to these informative members of the Beinecke staff and Yale conservators etc. How easy it must be to simply ask them a question such as this, and be handed the answer. I don’t suppose you recall the name of that knowledgeable and acutely observant person who mentioned the “very tiny writing” and told you that to acquire such skill takes some training? I don’t want to make use of him and his observation without acknowledgements; as much for what was said as the depth of the expertise informing it. Parchment, vellum, usage of the terms has changed with time. Nowadays it’s still not used in the same way in different countries. As regards the follicles, it could be of interest to point to images where they are clearly visible. I was standing next to them as they were poring over several sheets (but certainly not the whole MS), and firmly stated what I wrote before. ‘Cow’ was only used in the DNA report, as this is the name of the species, but of course it is calf skin. Unfortunately, it is also not easy for me to just ask questions. I’ve been fortunate to have had this chance to meet them. I was going to ignore the comment about tiny writing, and what you wrote about me in a micrography post on your web site, but there is actually something useful out of this for everyone. Lots of people are used to looking at the blown-up digital scans of the MS at the Jason Davies site, or the Beinecke site. One loses the connection with the physical MS and its dimensions. Really, everybody can figure out for himself what is the size of the charcters in the MS. Where they are at their smallest, they are no more than 1-2 mm in size. No need to acknowledge anyone for this fact. There’s a good example of a bible with tiny writing. No need to invoke any Jewish heritage here. Rene, forgive me for being late on this topic and for coming with an obscure question. But was there any mention whether the parchment was whole or split? Hello Emma; no, this was not mentioned at all. For my part, there are no buildings with dovetail battlements (Schwalbenschwanzzinnen ) north of the Alps known where built before 1500th Which brings me back to my beginning. Whether French German or Italian. In the end it’s probably vulgar, in which arrangement also always. My question was to clarify what inferences you take from the information, not to make any of my own, Rene. It’s good to know that the codicology is being paid attention now by the general Voynich community. Nick Pelling wasn’t too successful, back in 2008, in generating enthusiasm for this fundamental issue in provenancing a manuscript. Doubt if my recent efforts have stimulated interest, either, but your public presence may just do the trick. Well, thanks. I can’t actually claim too big a role in this. The recent initiative is clearly from the Beinecke itself, who are interested in moving the MS away from the realm of unlimited speculation by amateurs, which often makes its way into semi-serious publications (popular journals), and into what it should deserve: to be treated like a genuine old MS with a purpose and a history. I’m sorry, I don’t quite get the point here. I understand that the manuscript was not bound in goatskin; the great majority of medieval manuscripts are not bound in goatskin, and those that are may come from Spain, England, north Africa etc. There seems to be something about the MS which distinguishes its cover from “the vast majority” of MSS in the group Vat.Lat.11414 – 11709, since you say that they have “identical” covers, whereas that on MS Beinecke 408 is described as “quite similar”. I take this to mean “not identical” and would be glad to know what the points of difference are, if you know them. Also – when you say “the MS collection …was described, sometime in the 18th Century, as “old books infested by worms”. Does that mean that every book in the Collegium Romanum was infested with wood-eating worms? Were all the books bound in wooden covers? I’m sure that woodworm was a constant problem for all libraries which had books bound in that traditional way; I read with great interest the account by a papal librarian of the methods used to deter book-worm during the eighteenth and nineteenth centuries. But to be exact: am I right in taking from all this that you wish to argue that the Boccaccio and the Vms were once on the same shelf in the College library, that both had wooden covers infested with worm in the eighteenth century, that both went to be rebound and were bound in calfskin (cowskin) at that time? Do you hope, or do you expect, that if they were on the ‘same shelf’ there will be some common theme to the rest which you can then propose will apply to the written component of the VMS? e.g. that it shares with the Boccaccio that it is poetry, or that it is lascivious, or that it is Italian, or that it dates from the fifteenth century… or something of that sort? Sorry to be dense, but I’m not sure I quite grasp the point here. The 20-odd books that Voynich acquired, and the 300+ that are now in the Vatican, definitely come from the same collection, from the Roman College library. Of course no two covers are ever identical, and I can only see this as nitpicking. My contact in the Vatican went down to the stacks and looked at the manuscripts and came back with this statement about that collection. Of the Voynich MS cover she could only look at a digital image. Different level of confidence. However, there is no reason to expect any difference, except that Voynich removed the paper pastedowns, and the bibliographical description(s) with it. The ones in the Vatican are still intact, and one cannot easily see the sewing, contrary to the Voynich MS.
Each bookshelf consisted of several (at least 6) shelves. The MSs were sorted by height (according to research of historians in the Gregorian archives). I don’t see this as relevant for the Voynich MS, though. 1) The present cover is not the original one. Useful to know, I think. 2) The material presented here is new, solid information about the MS (which is quite rare). Even if it does not help in translating it. Many aspects of the early history of the MS can still be deduced from codicologial evidence. This has to come from qualified people who can study the actual MS, not digital images. This can lead to pointers to its place and time of creation, though most probably not to the meaning or contents of the text and illustrations. – can the stitching of the MS be dated and located? – is there evidence of an earlier stitching? These are, of course, all closely related to each other. Work is on-going on this, though obviously outside the amateur internet community. I also don’t hear much about it.